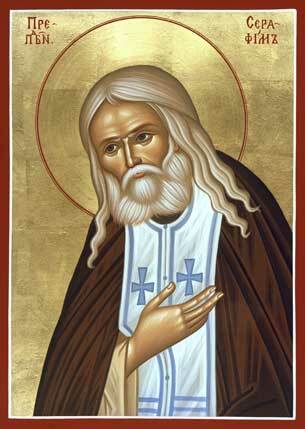 St. Seraphim of Sarov: . . . the devil strives to lead a man into despair. . . .
Just as the Lord is solicitous about our salvation, so too the murder of men, the devil, strives to lead a man into despair. A lofty and sound soul does not despair over misfortunes, of whatever sort they may be. Our life is as it were a house of temptations and trials; but we will not renounce the Lord for as long as He allows the tempter to remain with us and for as long as we must wait to be revived through patience and secure passionless! Judas the betrayer was fainthearted and unskilled in battle, and so the enemy, seeing his despair, attacked him and forced him to hang himself, but Peter, a firm rock, when he fell into great sin, like one skilled in battle did not despair nor lose heart, but shed bitter tears from a burning heart, and the enemy, seeing these tears, his eyes scorched as by fire, fled far form him wailing in pain. And so brothers, St. Antioch teaches, when despair attacks us let us not yield to it, but being strengthened and protected by the light of faith, with great courage let us say to the evil spirit: “What are you to us, estranged from God, a fugitive from heaven and evil servant? You dare do nothing to us. Christ, the Son of God, has authority both over us and over everything. It is against Him that we have sinned, and before Him that we will be justified. And you, destroyer, leave us. Strengthen by His venerable Cross, we trample under foot your serpent’s head” (St. Antioch, Discourse 27). This entry was posted in Sayings from Saints, Elders, and Fathers, St. Seraphim of Sarov and tagged Apostle Peter, Conquering Evil, Courage, Cross, Demons, Denial of God, Despair, Faith, Faith in God, Fall of Satan, Falling Down Getting Up, Judas Iscariot, Living Orthodoxy, Repentance, Sign of Cross, Sin, Spiritual Labors, Spiritual Tools, Spiritual Warfare, Suffering, Temptations, The Evil One, Trials on September 22, 2014 by ocqadmin. Then one of the twelve, called Judas Iscariot, went unto the chief priests, and said unto them, What will ye give me, and I will deliver Him unto you? (Matt. 26:14–15). These words seem to be clear and not to hint at anything more, but if you carefully examine each word, you will find deep meaning and a great deal to contemplate. First, the time. The Evangelist does not indicate it without cause. He does not simply say, “One of the twelve went,” but adds, Then one of the twelve … went. Then. Tell me, when? And why does he indicate the time? What does he want to teach me? He does not say Then for no reason: speaking by the Spirit, he does not say anything at random or to no end. Therefore, what does this “then” mean? Before that time, before that hour, a harlot came with an alabaster box of ointment and poured the oil onto the head of the Lord. She displayed great service; she displayed great faith, great obedience, and great piety. She was turned from her former life and became better and wiser. And when the harlot had repented, when she had been drawn to the Master, then the disciple betrayed his Teacher. Thus the Evangelist said then, so that you not accuse the Teacher of weakness when you see the disciple betraying Him. For the power of the Teacher was such that He drew even harlots to proper obedience. not constrained or forced. Rather, of himself and of his own accord, he gave birth to his intention and brought forth his treachery, without any counselor in his wickedness. This entry was posted in Sayings from Saints, Elders, and Fathers, St. John Chrysostom and tagged Apostles, Betrayal, Betrayal of Jesus, Judas Iscariot, Prostitutes, Repentance on April 16, 2014 by . 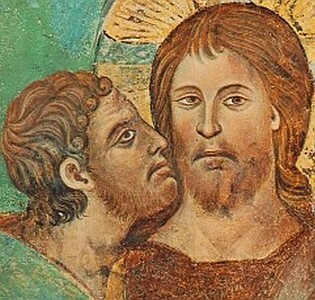 Bridegroom Matins: Oh, the wretchedness of Judas! . . .
Oh, the wretchedness of Judas! but deceitfully he contemplated the kiss of betrayal. She loosed her hair while he bound himself with wrath. for envy cannot distinguish value. Deliver our souls, from this, O God. This entry was posted in Church Prayers, Hymns, Services, Holy Week and tagged Anger, Betrayal of Jesus, Bridegroom Matins, Envy, Harlot Washing Jesus' Feet, Holy Wednesday, Holy Week, Judas Iscariot, Myrrh, Repentance on April 16, 2014 by . Bridegroom Matins: As the sinful woman was bringing her offering of myrrh . . .
the disciple was scheming with lawless men. She rejoiced in pouring out her precious gift. He hastend to sell the precious one. She recognized the Master, but Judas parted from Him. She was set free, but Judas was enslaved to the enemy. grant us also repentance, and save us. This entry was posted in Church Prayers, Hymns, Services, Holy Week and tagged Betrayal of Jesus, Bridegroom Matins, God as Man, Harlot Washing Jesus' Feet, Holy Wednesday, Holy Week, Judas Iscariot, Myrrh, Passions, Repentance, Salvation, Slave to Sin, Sloth on April 16, 2014 by . Bridegroom Matins: Judas loves money with his mind. . . .
A payment for the deeds the wretch gains hanging and a terrible death. From his lot deliver us, O Christ God, granting remission of sins to those who celebrate Thine immaculate passion with love. This entry was posted in Church Prayers, Hymns, Services, Holy Week and tagged Betrayal of Jesus, Bridegroom Matins, Darkening the Mind/Nous, Darkness, Death, Forgiveness, Forgiveness of God, Greed/Avarice, Holy Tuesday, Holy Week, Judas Iscariot, Light, Light and Darkness, Mind, Suicide on April 15, 2014 by . St. John Chrysostom: Let us not then make ourselves unworthy of entrance into the bride-chamber . . .
Let us then, I beseech you, recover our senses here and let us recognize our Master as He ought to be recognized. For only when we are in Hades should we abandon the hope derived from repentance: for there only is this remedy weak and unprofitable: but while we are here even if it is applied in old age itself it exhibits much strength. Wherefore also the devil sets everything in motion in order to root in us the reasoning which comes of despair: for he knows that if we repent even a little we shall not do this without some reward. But just as he who gives a cup of cold water has his recompense reserved for him, so also the man who has repented of the evils which he has done, even if he cannot exhibit the repentance which his offenses deserve, will have a commensurate reward. For not a single item of good, however small it may be, will be overlooked by the righteous judge. For if He makes such an exact scrutiny of our sins, as to require punishment for both our words and thoughts, much more will our good deeds, whether they be great or small, be reckoned to our credit at that day. Wherefore, even if thou art not able to return again to the most exact state of discipline, yet if thou withdraw thyself in a slight degree at least from thy present disorder and excess, even this will not be impossible: only set thyself to the task at once, and open the entrance into the place of contest; but as long as thou tarriest outside this naturally seems difficult and impracticable to thee. [Matt. xxv. 34; 249 Luke xvi. 26]. For before making the trial even if things are easy and manageable they are wont to present an appearance of much difficulty to us: but when we are actually engaged in the trial, and making the venture the greater part of our distress is removed, and confidence taking the place of tremor and despair lessens the fear and increases the facility of operation, and makes our good hopes stronger. For this reason also the wicked one dragged Judas out of this world lest he should make a fair beginning, and so return by means of repentance to the point from which he fell. For although it may seem a strange thing to say, I will not admit even that sin to be too great for the succor which is brought to us from repentance. Wherefore I pray and beseech you to banish all this Satanic mode of thinking from your soul, and to return to this state of salvation. This entry was posted in Sayings from Saints, Elders, and Fathers, St. John Chrysostom and tagged Chastisment of God, Christ as Bridegroom, Despair, Evil, Falling Down Getting Up, God as Judge, Hell, Judas Iscariot, Judgment Day, Kindness, Living in the World, Living Orthodoxy, Mercy, Mercy of God, Repentance, Rich Man and Lazarus, Salvation, Sin, Suffering, The Evil One, Works, Worldliness on March 21, 2014 by .